A decade after the cityʼs most infamous apartment deal collapsed, investors are still fighting over the money lost and won in Stuyvesant Town. The New York State Appellate Division of the Supreme Court has upheld a ruling that could have forced special servicer CW Capital to shut down sales until a fight over the $1 billion it earned while serving as caretaker to the 11,200-unit apartment community is resolved. CW Capital — an affiliate of Fortress Investment Group — was appointed special servicer to the $3 billion Stuy Town/Peter Cooper Village mortgage after Tishman Speyer handed back the keys to the historic East Side development in 2010 following the market crash. The complex was originally purchased in 2006 by Tishman Speyer and BlackRock for $5.4 billion. When they defaulted on the mortgage, CW Capital was put in charge of the property management and creditors for the years the property remained in default. The company set up to manage Stuyvesant Town after it fell into receivership has closed. CompassRock was originally founded by special servicer CWCapital in 2012 to manage multifamily properties around the country. However, its two biggest jobs were at the 11,200-plus-unit Stuy Town, and at Riverton Houses in Harlem, where it managed 1,229 apartments. In January this year, CompassRock lost its contract at Riverton when CWCapital sold the property to A&E. Then in April, the firm got the boot from Stuy Town when new owner Blackstone replaced it with its own subsidiary company, StuyTown Property Services. CWCapital declined to comment on the current status of CompassRock, whose website has been down for months. Phone numbers listed for the company had no option to leave a message. The state housing agency has approved major capital improvement rent increases (MCIs) for four buildings in Peter Cooper Village that underwent exterior restoration work — and more are expected to be approved. The Tenants Association warned neighbors about the approvals of the MCIs, previously referred to by TA President Susan Steinberg as CWCapital’s “goodbye present,” in an email blast on Sunday. As of July, the association had heard about the MCIs being filed for 19 different buildings in Peter Cooper and Stuyvesant Town. The cost varies at different addresses, from about $1.15 to $3 per room per month. Reached on Monday, Steinberg said the association, which did challenge the MCIs, will continue to do so. Some of the MCIs were requested as far back as August of 2014. Three months after taking over the property, Blackstone has announced the name of its own recently formed management company that will handle the day-to-day operations at Stuyvesant Town/Peter Cooper Village. This is following CompassRock’s official exit from ST/PCV on April 1. Unlike CompassRock, the new company, called “StuyTown Property Services,” will — as its name suggests — just be for the management of ST/PCV, according to a Blackstone spokesperson. In other management changes, along with four recent plumbing hires, StuyTown Property Services has also added three new people to its resident relations division. Those employees will be responsible for cleanliness inspections, maintenance issues and hands-on resident relations, said Blackstone spokesperson Paula Chirhart. In January, resort and residential industry veteran Rick Hayduk was hired as Stuy Town’s new general manager. He was also the first person in that role to move into the community since the Met Life days, and is the new company’s CEO. Meanwhile, this is the second apartment complex CompassRock has lost from its portfolio in recent months. CompassRock, CWCapital’s management arm formed in 2012, had been managing the 1,229-unit Riverton Houses in Harlem while CWCapital oversaw the property following an over-leveraged deal. Then last December, Riverton was sold to A&E Real Estate, and according to a spokesperson, Daniel White, A&E prefers to do its own management of the properties it owns. While the events taking place in Stuyvesant Town ever since the historic sale to Tishman Speyer have hardly lacked for headlines, from the point of view of a former resident, the story that was not being told — at least not nearly enough — was that of how the aggressive attempts to turn over apartments impacted individuals. Lisa M. Morrison, along with two other people, have since written a book on the subject, called Priced Out: Stuyvesant Town and the Loss of Middle-Class Neighborhoods. The book, published by NYU Press ($28 paperback), was released on March 15 and is available at nyupress.org and on Amazon. Co-authors are Rachael A. Woldoff and Michael R. Glass. “It has a lot of different angles and kind of looks at the issue from different perspectives,” Morrison said. She also suggested the book is complementary to Charles Bagli’s Other People’s Money, which offered a behind-the-scenes look at the infamous $5.4 billion deal and the real estate feeding frenzy that led to such a speculative and ultimately predatory investment. People who’ve been wondering how to get their hands on an affordable apartment in Stuyvesant Town won’t have to wait any longer to get a shot at it. As of today, Tuesday, March 1, the application for a city-run lottery for the 5,000 units that will eventually be made available, has begun. The way it works, since there’s no telling when each of the units will actually become vacant and available, is that a maximum of 15,000 names of applicants will be put onto a waiting list. Applications will be accepted through March 31 on a website, pcvstlottery.com, and can also be mailed. To request an application by mail, send a self-addressed stamped envelope to Stuyvesant Town/Peter Cooper Village, 243 Fifth Avenue, Box 425, New York, NY, 10016. The process does not give any preference to existing tenants of Stuyvesant Town-Peter Cooper Village, which is something market rate-paying residents had hoped for. Instead, the only preference given will to be to applicants who currently live in the five boroughs, with their applications being reviewed first. On the fact that no preference will be given to tenants, a spokesperson for Blackstone, Paula Chirhart, said this was the decision of the city’s HDC (Housing Development Corporation). “While we appreciate the spirit of inclusiveness, we are disappointed that we were not able to provide a preferred option for residents of Stuyvesant Town-Peter Cooper Village,” said Chirhart. Following the sale of Stuyvesant Town/Peter Cooper Village, at a record-breaking price of $5.45 billion, the property’s senior lenders who’d forked over $3 million are finally getting repaid. According to a report issued in mid-January by real estate analysis firm Trepp “the ship has come in” finally, at least for one of the tranches of the CMBS (commercial mortgage backed securities) packaged deal. The smallest one at a measly $202.2 million – had been repaid. That piece represented 11.3 percent of the entire deal. Since last summer, five new studio apartments have popped up in Stuyvesant Town. At this time, though they’re not yet on the market, they will be soon, having finally completed their transformation from former trunk rooms and other spaces once used for storage. The rents for the studios, which are bigger than the five studios built last year on Avenue C, haven’t been officially determined yet. A Blackstone rep said that won’t be decided until a city inspection. However, they will be market rate. CWCapital had declined to comment on the units as they were being built at 250, 270, 280 and 300 First Avenue and 435 East 14th Street. Permits for their being built were approved on June 30. Riverton Houses was sold to A&E with the city providing some tax breaks. Less than two months after the announcement of the sale of ST/PCV, the city came to a similar agreement with Riverton Houses’ new owner A&E Real Estate to protect almost 1,000 low and middle-income homes at the development in Harlem, announcing that the property was sold for $201 million last Wednesday. CWCapital had been in control of Riverton, a sister property of Stuyvesant Town/Peter Cooper, since 2010 after taking over from Larry Gluck’s Stellar Management. Stellar had bought the development in 2005, hoping to bring in higher-paying tenants, but defaulted on its $225 million mortgage and its lenders foreclosed. 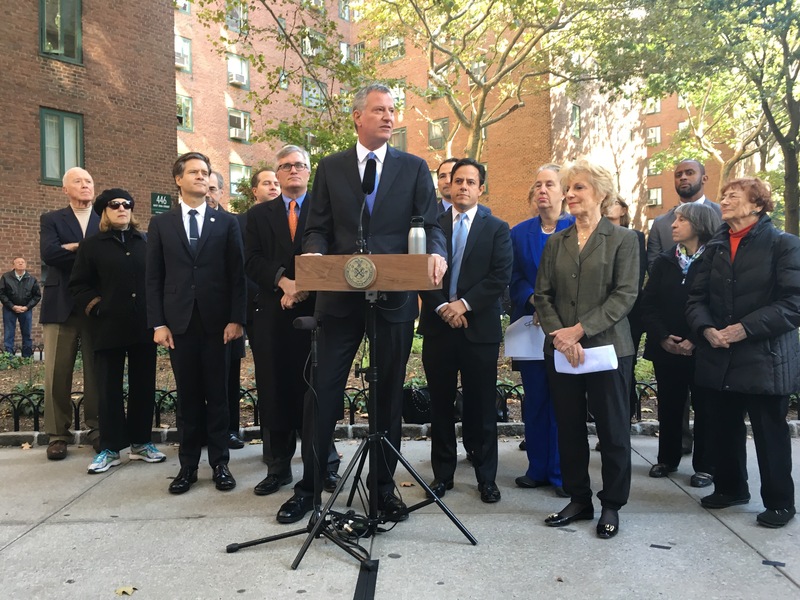 The property was sold under an agreement to keep the remaining rent stabilized units affordable and in exchange, the city will provide A&E with property tax breaks and other incentives worth about $100 million. Affordability is being preserved through a real estate tax exemption, which will be provided for 30 years and was approved by City Council. On the heels of news that CWCapital, Stuyvesant Town’s controlling entity since 2010, could walk away with over a half a billion dollars in fees from the recent sale and other services, investors have filed suit to try to prevent that from happening. Investor groups with a trust that’s a lead lender of the property’s senior debt filed the legal action last Thursday. This was after, they said, CWCapital “deflected or ignored” their questions about how the company intended to disperse the reportedly massive windfall. The plaintiffs, affiliated with hedge fund Appaloosa Management, are: Appaloosa Investment, L.P.I, Palomino Fund Ltd., Thoroughbred Fund L.P., and Thoroughbred Master Ltd. The investors said CW has reportedly claimed it is entitled to about $566 million in default interest, based on a three percent rate on the senior loan calculated from 2010 and the fact that the property was sold for more than the senior debt. However, the plaintiffs argued, that money is not supposed to go to CWCapital, but instead to senior lenders. 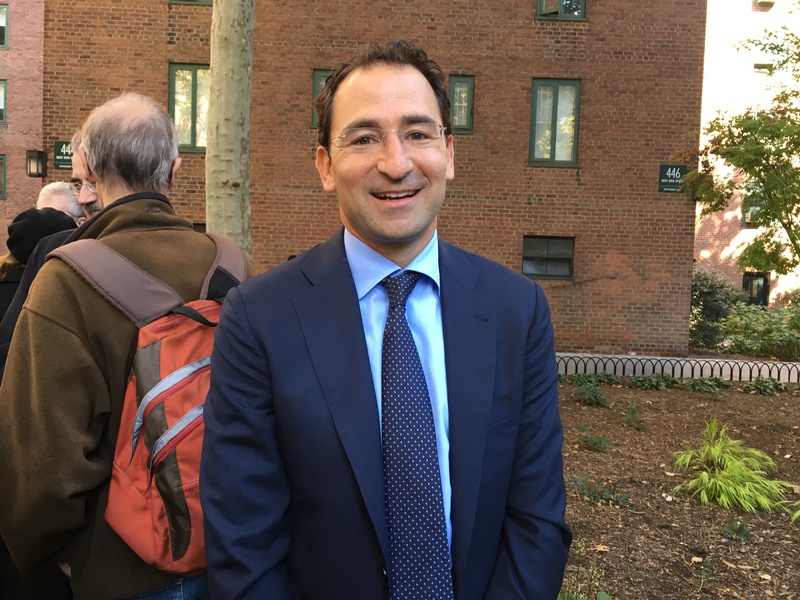 Following the news about a change in ownership just a few days earlier, over 500 Stuy Town residents showed up at a meeting on Saturday where a representative for the new landlord, Blackstone, answered questions. Mayor Bill de Blasio popped by for a bit and spoke, as did U.S. Senator Charles Schumer, but the real star of the show wound up being Nadeem Meghji, senior managing director for Blackstone. Meghji started off by telling tenants at Baruch College’s auditorium that their various concerns, brought up in the days following the sale, were being taken “very seriously.” He indicated CompassRock would not continue to manage the complex, but then later said there isn’t a timeline for any change in management teams. Meghji, who was in charge of the Stuy Town deal, frequently elicited applause when responding to tenants’ questions although he admitted he didn’t yet have enough information to answer them all. He told tenants, in response to questions about student apartments, that Blackstone had been hearing about this issue more than any other. He added that Blackstone would be seeking further tenant feedback via focus groups and a hotline. “We know that we are going to need to earn your trust,” he said. The owners of the Associated Supermarket in Stuyvesant Town — who, as Town & Village reported last month — were losing faith they’d be given a lease renewal by CWCapital, finally got that elusive phone call from the landlord. It just wasn’t the one they wanted. The offer? Take three quarters of a million dollars to walk away before the lease even ends in two years, one source with knowledge of the situation told Town & Village. However, the store’s principal owner Joseph Falzon felt he could make more if he rode out the rest of the lease term. Falzon had told Town & Village in September that he hadn’t gotten an answer about renewal for over a year with CW declining to talk business, while Falzon wanted to make sure the franchise had a future before investing in a much-needed renovation. Meanwhile, he said he was told a competing supermarket had offered CW double the rent he was paying, now around $60,000, only to be denied. Reached on the phone last Thursday (prior to the property being sold), Falzon confirmed he’d gotten an offer to leave early and that he wasn’t interested in doing so. A renovation won’t happen, though, since Falzon said “it wouldn’t pay” for only two more years at the location. The biggest flop of New Yorkʼs real estate boom was on Tuesday hailed as the biggest win for its working class. 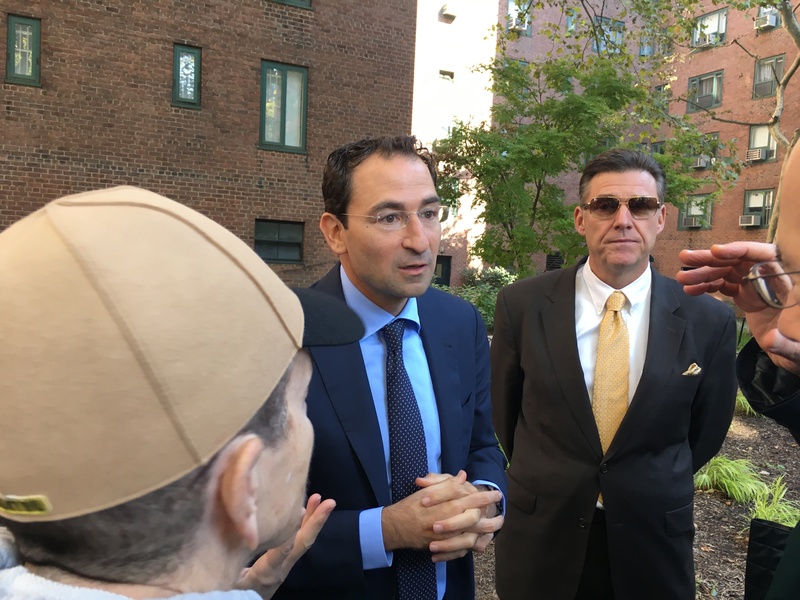 Announcing that investment firm Blackstone and Canadian hedge fund Ivanhoe Cambridge will pay $5.3 billion for the 11,241-apartment Stuy Town/Peter Cooper Village apartment complex, Mayor Bill de Blasio crowed, “This is the mother of all preservation deals. Nearly six years after Tishman Speyer walked away from Stuyvesant Town after defaulting on loan payments on a $5.4 billion deal to buy it, de Blasio, along with other elected officials, tenant leaders and Jonathan Gray, global head of real estate for Blackstone, cheered the new sale as a win for tenants and the city at a press conference inside Stuyvesant Town’s First Avenue Loop. According to the mayor’s office, the deal will prevent the loss of what had been a rate of 300 affordable apartments each year. Under the deal, tenants at the affordable units will be able to remain in place, but when they move, new tenants moving in will have restricted rents if they meet certain income requirements. Of the 5,000 affordable units, 4,500 will be rented to households earning no more than $128,210 for a family of three, and the remaining 500 apartments must be rented to families earning no more than $62,150 for a family of three. None of those tenants will pay more than 30 percent of their income in rent. Along with ensuring the apartments that are currently affordable remain that way, so-called “Roberts” tenants who are currently in renovated apartments paying higher rents will get five additional years of another kind of rent protection. When the J-51 tax abatement program expires in 2020, their apartments will no longer be rent-stabilized. Under the agreement, rent increases for those 1,400 tenants would be capped at five percent a year for five years. While there are still many details to be worked out — Gray said he was still learning about a big concern of tenants, which was the property’s population of students­ — some questions have been addressed by the company already on a website, stuytownpetercooper.com. One question posted online is how the decision will affect market rate tenants, to which Blackstone said it would “maintain the status quo.” The company also said the transition wouldn’t impact the property’s employees’ jobs or their current pay and benefits. Blackstone has also promised not to build on top of the property’s open spaces. 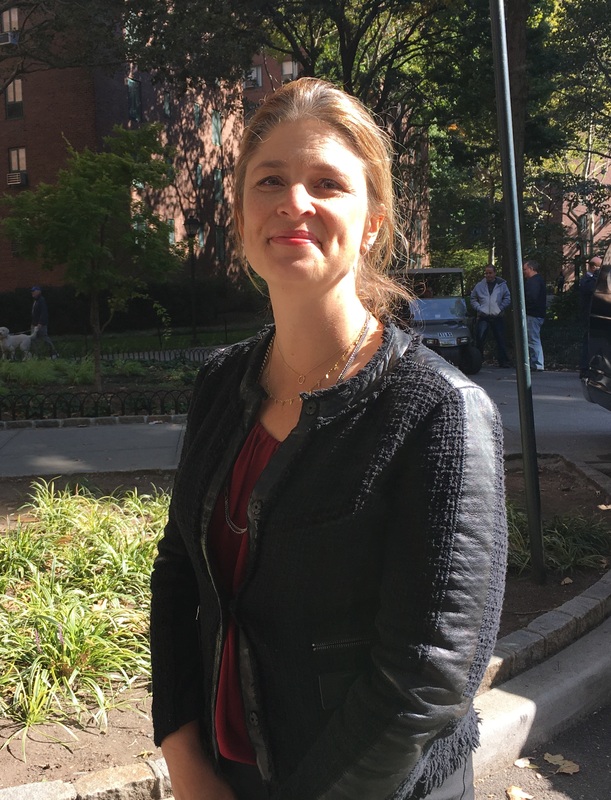 As for how new tenants would be eligible for an affordable apartment, Deputy Mayor Alicia Glen said a possibility was a lottery, which, she admitted, typically involves a waiting list. Despite the price paid — $100 million less than Tishman Speyer’s winning bid — Gray said tenants shouldn’t fear that the switch in ownership will lead to a replay of a desperate landlord trying to oust low-rent-paying tenants. Gray said the amount the company is borrowing to finance the deal is only 50 percent of the cost, “which, in context with buying a house, 50 percent is very low leverage,” he said. He also said he expected that the rental market in Manhattan would remain strong. Tenants will have the opportunity to ask questions about the new ownership at a town hall meeting set to take place on Saturday, October 24 at 1 p.m. at Baruch College, 17 Lexington Avenue at East 23rd Street. Meanwhile, on Tuesday, ST-PCV Tenants Association President Susan Steinberg said she was happy with the outcome even though it wasn’t the non-eviction condo conversion the association had wanted to see through with partner Brookfield Asset Management. Brookfield, Steinberg explained, had been the TA’s partner as a bidder in the event of a foreclosure auction. However, this deal did not involve an auction. She also said tenants’ hopes of owning condos seemed to become bleaker as the property climbed in value in recent years, which would make buying less affordable than originally thought. However, she added, “We didn’t lose sight of the prize,” referring to tenants’ insistence of preservation of ST/PCV “as a single unit and preservation of open space. 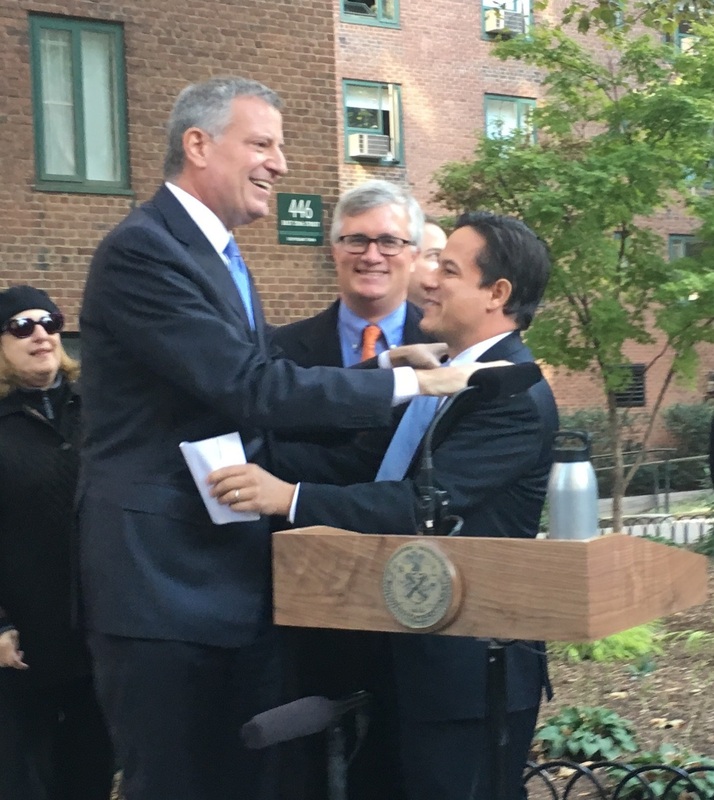 Council Member Dan Garodnick, who, along with the Tenants Association and the mayor, was very involved in the negotiations, echoed the sentiment. He also told T&V that while the current plan didn’t include a conversion, Blackstone has said it would be open to the idea. As for what happens after the 20-year affordability arrangement ends, de Blasio said that would in all likelihood be a matter for the city’s government at that time. Blackstone Group LP is the world’s biggest alternative-asset manager. This summer, it gathered $15.8 billion to invest in global real estate. According to Bloomberg News, the firm collected more than 90 percent of the pool, its eighth fund for global property, from institutions in about four months, a person with knowledge of the matter said in March. The remainder was raised from individual investors. New York-based Blackstone has already committed 20 percent of the fund to deals including $14 billion for real estate assets being divested by General Electric Co., and nearly $4 billion to buy Strategic Hotels & Resorts Inc. In July, the firm acquired a 25-parcel package from the Caiola Family. That $700 million grouping holds about 1,000 apartments which are centered near the Upper East Side and Chelsea. It increased its presence in the boroughs, snatching up Sky View Parc for $400 million in Flushing in June. But even though the company’s seven previous global property funds have doubled their invested capital, the city isn’t taking any more chances with Stuy Town. Glen told reporters that if the market does go south and things don’t go the way Blackstone is picturing, even if the company sells the property, the next owner would be bound by the same terms Blackstone has agreed to. In exchange for preserving affordability, the new owners will not have to pay transfer taxes, saving them about $140 million, and they won’t have to pay a $75 million mortgage tax. This arrangement also saves tax payers money, Glen said, by offering a one-time exemption instead of an ongoing abatement. “Normally with an affordable housing project, the owner gets a break on taxes every year,” she said. Until recently, CWCapital’s effort to sell had been hampered by a lawsuit filed by junior lenders represented by a company called Centerbridge Partners. The lenders had hoped for a chance to buy a key piece of the junior or mezzanine debt and accused CW of violating an intercreditor agreement when the servicer took title of the property through a deed last year instead of holding a foreclosure sale. CW did not respond to a request for comment on the sale.